= Maggie sensei no ketsuekigata wa nan desu ka? = Eeto, ei? bii? cii??? Today I will talk about 血液型 ( = ketsueki gata). But it has nothing to do with medicine. As always, let’s look at the kanji first! Blood in Japanese is either 血液 ( = ketsueki) or 血 ( = chi). While 血液 ( = ketsueki) is formal and can be used as a medical term, we use 血 ( = chi) in a daily conversation. (We also say 出血 (=shukketsu) for bleeding. =”Anata no ketsueki gata wa nan desu ka? Many Japanese love to analyze your personality by blood type — just for fun. 血液型占い ( = ketsueki gata uranai) a fortune teller who goes by your blood type. 血液型性格判断 ( = ketsueki gata seikaku handan) a blood type based personality test. 血液型相性診断 ( = ketsueki gata aishou shindan.) a blood type based (love-partner) compatibility test. many *天才 ( = tensai) genius people are AB. etc. You can see they are totally biased. This just goes to show just how much we believe in the accuracy of blood-type based personality analysis. 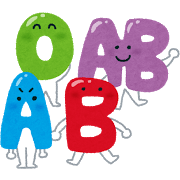 Many of us think the blood type is important factor to know our 相性 ( = aishou) compatibility like 星占い ( = hoshiuranai) or 占星術 ( = senseijutsu) horoscope. Some blood personality checks also astrology. There are even some companies that take the blood type so seriously that they decide their personnel based on the blood type and some people chose their partners by blood types. Example sentences regarding the blood types. = ”Kare wa bii gata dakara watashi to aishou ga awanai no. = “Ano hito wa iikagen dakara kitto oogata dayo. = “Kanojo tte ketsueki gata eibii janai? Datte chotto tsukamidokoro ga nai mono. = Joushi wa bii gata no ningen towa aishou ga awanai to itte iru. = ”Kare ga bii gata tte iu no wa igai da. Ooraka dakara ou gata ka to omotta. = Watashitashi wa aishou ga ii. = We have a good chemistry. = Maggie to Cookie towa aishou ga awanai. = Maggie and Cookie don’t get along well. = Inu no ketsueki gata wa zenbu de juusan shurui ijou mo arun desutte. = I heard there are more than 13 dog blood types. = Watashi no ketsueki gata wa shiranai kedo, kitto yasashikute kawaii seikaku no ketsueki gata dato omou no. = I don’t know what my blood type is but I bet it is the one for “sweet” and “cute” personalities. Hi Maggiesensei, I made questions for two different lessons today, hopefully I am not asking too much at the same time. There is no need for sensei to answer right away, I can wait. “grip” on. Is that right sensei? b) I wanted to know about “dokoro”. I read it is used for emphasis and negation, right? Sensei wrote that this expression means “conventional”. “Conventional” in what form sensei? 3) Does the “aishou” have a sentimental connotation or can I use it when referring to friends? Sensei, can I use “nanika” to convey the meaning of “somewhat” as well? You use this expression for a mysterious person who you can’t tell what they are thinking about. So imagine people who are fixed in a mold which is made by society or one’s group. They behave, say or think as other people. They do the same routines everyday. No originality. In that sense, the are conventional. People don’t do things spontaneously. 3) Yes, 相性がいい，悪い is used all the time for any human relationships. Sensei, is it possible to have an example sentence with the usage of 型にはまった? OK, 型にはまる(= conventional, stereotyped, formulaic) is usually used in a negative connotation. Is your blood type A? Don’t worry. They are not accurate at all! I think the right term is “transfusion”, blood infusion sounds a little creepy (o_O’). I found it very surprising that, at a recent interview, the interviewer said to my friend that her blood type wasn’t compatible with the company. You are right. “infusion” is also listed in the dictionary but “transfusion” is more adequate. I will revise it. my blood type is B all info r wrong about me!!!!! @Bridget Nazis did quite a lot of absurd “research”, this blood type thing would fit into it. Thank you for this great article and cute pic Maggie先生 !! Finaponのコメントありがと〜〜う！！I think I have learned a lot since I wrote this article reading through the comments as well. Ahhh…so many things to learn in this world besides where to dig a hole to hide my bone! This explains so much! I was always so confused on how a lot of Japanese profiles and such have the blood type yet I don’t even know my own. Thanks for the help! I’m really liking this website! Thank you for your comment! Glad to hear this lesson was helpful! Before & during the second world war, the Nazis were also obsessed with this “blood type + personality” nonsense, and supposedly did quite a bit of “research” on it. It’s always important to remember whose side Japan was on during the second world war. I know that in Japan, people treat it like a horoscope, you know, like, just for fun, but if they knew where most of this “information” on blood types came from, I’m sure they’d be pretty surprised. Anyway, I refuse to take part in any of their little customs to keep from placing me into any kind of stereotype, be it from my blood type, nationality, or whatever. It’s annoying. Yes! Please visit here again! Actually, fureto-san isn’t massively off the mark with his Nazis comment. I heard that the original Japanese blood-type research was a response to a western study which claimed that Asian people were closer to animals because type B is more common in both animals and in Asian people. The blood-type obsession in Japan is one of my pet hates. It drives me up the wall. This is the first time I’ve seen your blog, Maggie, and I think I’ll be back. Nice to see lots of Kanji and example sentences and stuff. I’ll be following on twitter too. It’s so crazy, I’ve seen people get along great at first but then when they learn each others blood types stop liking each other. PS- Maggiesensei.com is the bomb! Really? Just like that? It is one of the extreme cases, huh? Wow, the ignorance in that comment is so extreme that it doesn’t even warrant a response beyond what I have now written. Also, I ask that you please not pro-create and perpetuate the cycle of ignorance any further than you’ve already taken it. Anyway, thanks for this insightful language lesson. I’ve still got a ways to go in learning the language, but your work puts me one step closer each time. Thanks. Sounds like something a Nazi would have developed… Just saying!